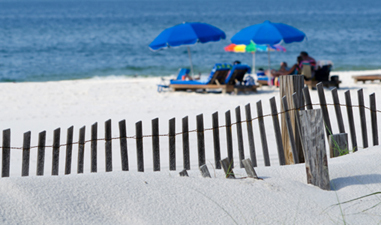 Gulf State Park is one of the quietest beach sites in Gulf Shores. Spacious surroundings allow you to spread out with your family without disruptions. This beach offers new beach pavilions with air conditioned restrooms, private showers, a snack bar, a huge fireplace, and lots of shade. There is a fee for entering the park that allows you all day access. Offering 900 acres of freshwater that is ideal for swimming, water skiing, boating, or picnicking, Gulf State Park is ideal for a full day of enjoyment. There are picnic tables and pavilions available for a small rental fee. You can purchase your fishing license here as this is a hotspot for this sport. There is a small entrance fee to get into the beach, but this fee does allow you all day access. Gulf Shores Public Beach lies at the dead end of Highway 59 at the Gulf. With convenient parking on site for a fee you are offered the comfort to unload your beach and picnic supplies with ease. This beach does offer a volleyball court, three open-air pavilions, picnicking area, beach attendants, restrooms, and showers on site. This is one of the most popular beach spots in the Gulf Shores area, so if you want to spend time here you will want to arrive early. Located just 2 blocks west of Highway 59, Gulf Shores' 2nd Street Public Access site offers free parking, outdoor showers, covered pavilions, and handicapped accessible restrooms. The 4th Street Public Access for Gulf Shores Beach only offers pedestrian crossing access to the beach. Visitors that are staying in the area and do not need to drive find this site ideal for their beach enjoyment. With beach access locations 5 and 6 blocks to the west of Highway 59, you will find that this beach is easy to find. Outdoor showers are available along Gulf Shores Beach. For those needing handicapped accessible services there are well equipped restrooms available along the 6th street access site. Visitors will find that this beach offers free parking across the street. There are outdoor showers available on site. Lagoon Park is located less than 3 miles west of Highway 59. You can enjoy all types of beach activities on the shallow waterway here that connects Little Lagoon to the Gulf. Free parking is available for guests that visit Lagoon Park at the northeast side of Lee Callaway Bridge. The park does offer an outdoor shower, water fountain, and clean restrooms for your use.